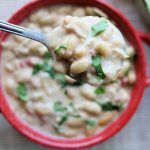 Homemade White Chili (Instant Pot or Slow Cooker)–Make white chicken chili from scratch using dried beans and tender chicken breasts. 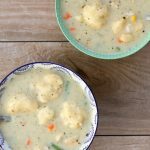 It’s thick and creamy and comforting. 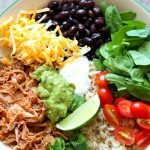 Although this recipe is homemade it’s made quickly in your Instant Pot or your slow cooker. 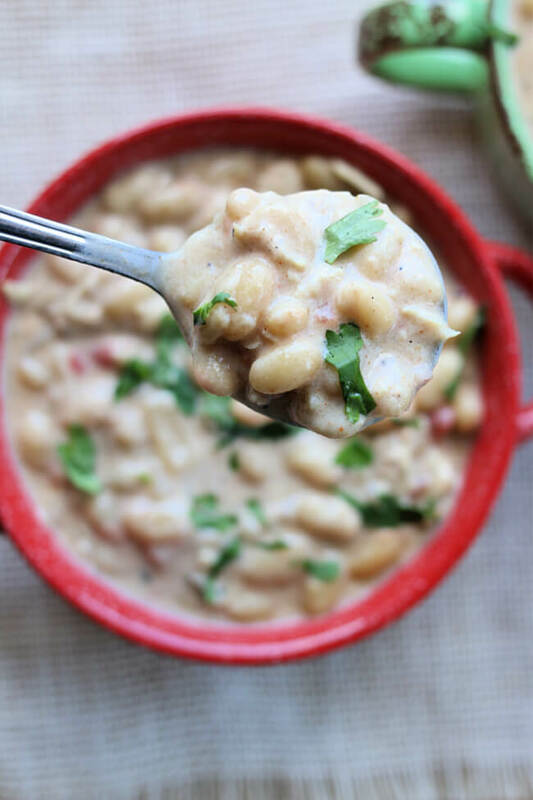 This white chicken chili screams fall to me! I picked up a bag of white beans at the store. I knew that I wanted to make a big pot of something delicious and this homemade white chili came to be. I love making a large pot of soup or chili because of the leftovers for lunch the next day. In my experience chili is always better the next day. There are very few things that taste better as leftovers but this chili is one of them. 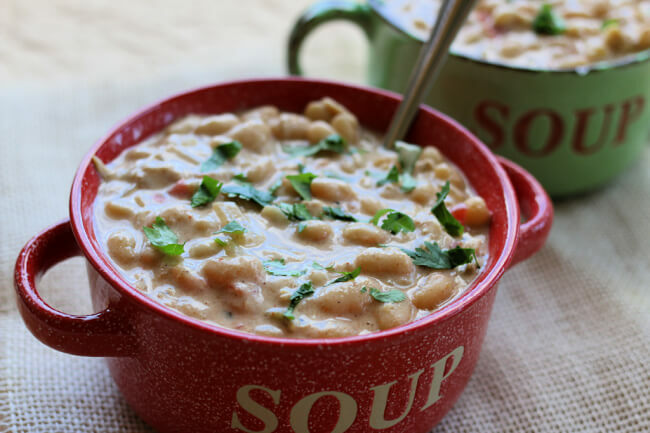 This homemade white chili has lots of great flavor thanks to the use of Better Than Bouillon. If you follow along with my website you know that I love using Better Than Bouillon in recipes that call for chicken broth. I use the Better Than Bouillon Roasted Chicken Base the most often. I just stir a teaspoon of the chicken base in with each cup of water. I love how I can keep Better Than Bouillon products in my fridge and just use them as I need them. They last a lot longer than an opened carton of chicken broth and they are so smooth and dissolve completely. My favorite ways to use Better Than Bouillon products are in soups, stews and chilis. The flavors taste like you’ve spent hours in the kitchen but really you’ve just spent a few minutes. You can also use Better Than Bouillon in recipes like Instant Pot Chicken Lettuce Wraps, Tuscan Chicken Ravioli and Brown Butter Pumpkin Risotto. I like to buy my Better Than Bouillon in the big jars at Costco. 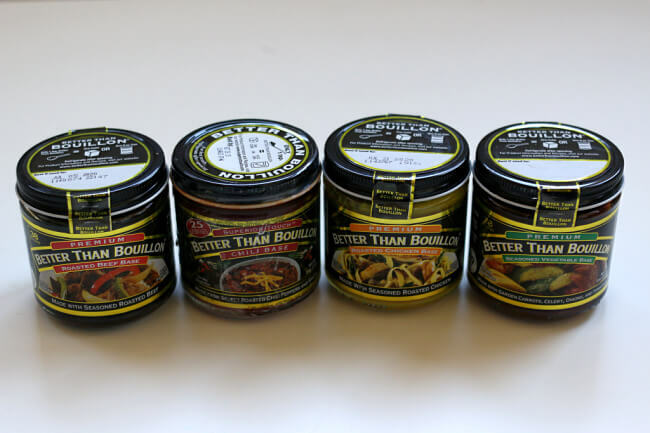 But if you can’t find Better Than Bouillon at your grocery store use the product locator on the Better Than Bouillon site or use the online ordering site to purchase those hard to find flavors! 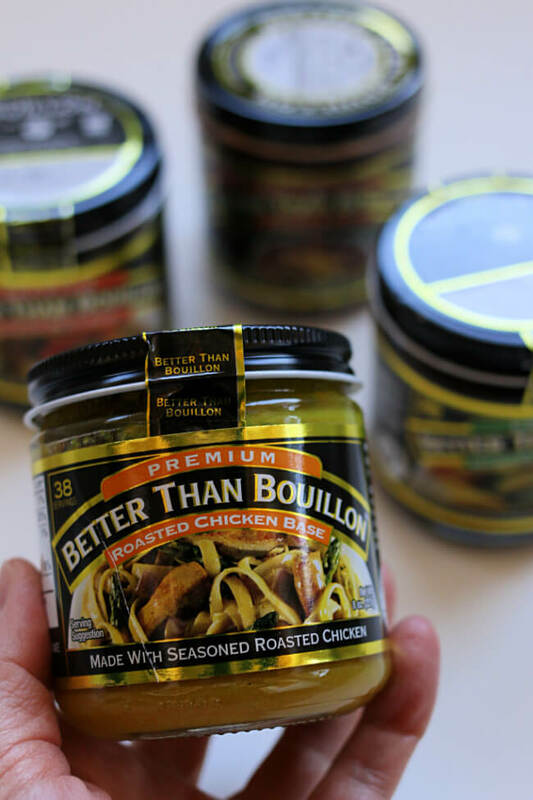 Follow Better Than Bouillon on their social media channels for lots of great recipe inspiration! 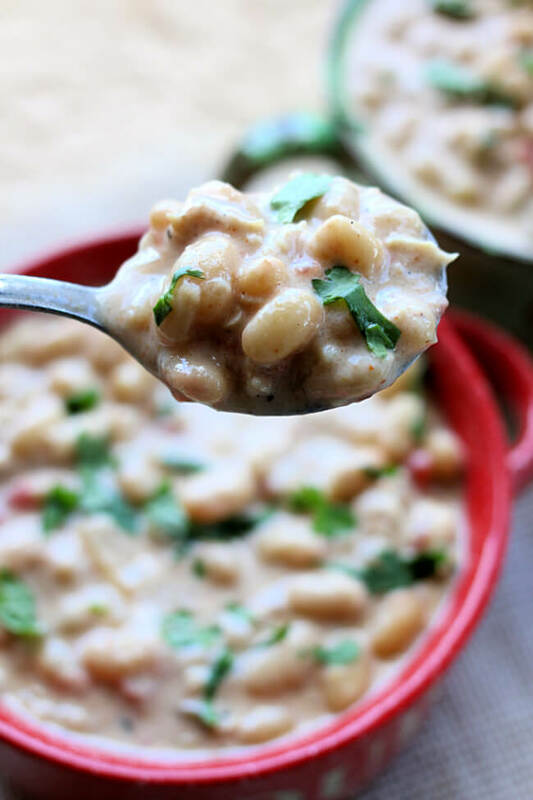 Make white chicken chili from scratch using dried beans and tender chicken breasts. It’s thick and creamy and comforting. 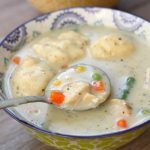 Although this recipe is homemade it’s made quickly in your Instant Pot or your slow cooker. Soak the beans. You can soak your dried beans overnight or you can soak them using the quick soak method. To soak overnight place beans in a large bowl and sprinkle with 1 tsp of salt. Completely cover the beans with water. Soak for at least 8 hours. Pour the beans into a colander and rinse them completely. To quick soak place the beans in the Instant Pot and cover completely with water. Sprinkle in 1 tsp of salt. Bring the water to a boil using the saute setting (lid off). Once the water boils turn off the saute setting and put the lid on the pot. Make sure valve is on sealing. Set the manual or pressure cook button to 2 minutes. When the 2 minutes is up perform a quick release. Use a colander to drain the beans and rinse them off. You can now use your “soaked” beans. 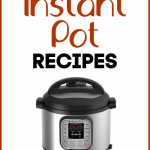 Saute: Turn your Instant Pot to the saute setting. While the pot is heating up, chop up your onion. When the display says HOT add in the oil and swirl it around. Then add in the onion and stir it for 3-4 minutes. It should become soft and translucent. Add in ingredients: Add in the water and the Better Than Bouillon. Stir until the chicken base is dissolved. Add in the soaked beans. Stir in the garlic powder, chili powder, cumin, black pepper and salt. Nestle the chicken into the pot. Lightly salt and pepper the chicken. Pressure cook: Cover the pot and secure the lid. Make sure valve is set to sealing. Set the manual/pressure cook button to 22 minutes on high pressure. When the time is up let the pot sit there for an another 10 minutes (display will read L0:10) and then move the valve to venting. Remove the lid. Shred the chicken: Remove the chicken from the pot and place it on a cutting board. Shred the chicken or cut it into small pieces. Add it back into the pot. Thicken the chili: Turn the pot to the saute setting. Add in the cream cheese and stir it in so it can start melting. Stir in the diced tomatoes with green chiles. In a glass bowl warm up the half and half in the microwave for 2 minutes (you can also warm on the stove in a saucepan). Once the half and half is warmed up whisk in the flour a tablespoon at a time. It should be completely smooth. Then scoop a cup of the hot soup into the half and half mixture. Stir. Stir the mixture into the Instant Pot. Let the mixture thicken the chili. Stir every minute or so for about 5 minutes, or until chili is thickened and the cream cheese is melted. Season to taste. Taste the chili and add in additional salt, pepper, cumin, chili powder if it is needed. Serve. Ladle the chili into bowls and top with snipped cilantro, if desired. Soak the beans. Place beans in a large bowl and sprinkle with 1 tsp of salt. Completely cover the beans with water. Soak for at least 8 hours. Pour the beans into a colander and rinse them completely. You can now use your “soaked” beans. Saute: Heat a pan over medium high heat on the stove. While the pan is heating up, chop up your onion. When the pan is hot add in the oil and swirl it around. Then add in the onion and stir it for 3-4 minutes. It should become soft and translucent. Add in ingredients: Add the onion into the slow cooker. Then add in the water, Better Than Bouillon, soaked beans, garlic powder, chili powder, cumin, black pepper and salt. Nestle the chicken into the pot. Lightly salt and pepper the chicken. Slow cook: Cover the slow cooker and cook on LOW for 8 hours, or until beans are tender. Shred the chicken: Remove the chicken from the slow cooker and place it on a cutting board. Shred the chicken or cut it into small pieces. Add it back into the slow cooker. Thicken the chili: Add in the cream cheese and stir it in so it can start melting. Stir in the diced tomatoes with green chiles. In a glass bowl warm up the half and half in the microwave for 2 minutes (you can also warm on the stove in a saucepan). Once the half and half is warmed up whisk in the flour a tablespoon at a time. It should be completely smooth. Then scoop a cup of the hot soup into the half and half mixture. Stir. Then stir the mixture into the slow cooker. Let the mixture thicken the chili by cooking on high for about 20 minutes. Season to taste. Once the chili is thickened and the cream cheese is melted taste the chili and add in additional salt, pepper, cumin, chili powder if it is needed. To make gluten free: Omit the flour and mix 6 TBS. cornstarch with water. Stir until completely combined then add to chili mixture. 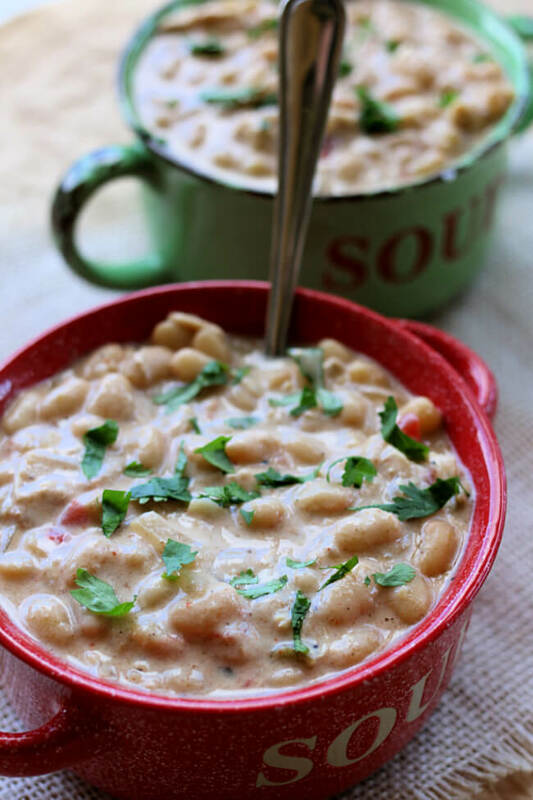 Like this recipe for Homemade White Chili (Instant Pot or Slow Cooker)? Get all my new recipes delivered to your email inbox by signing up below. 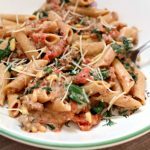 I made this in my instant pot and absolutely loved it. So darn good. This will be a regular dish for my family now. . 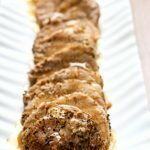 I already sent this recipe to two of my friends to share also. Thanks for sharing! Wow this is so nice to hear, Kellie! I’m glad you enjoyed it! I only used half the ingredients in this recipe for the two of us (except for the onions and garlic – used the full amount), added a couple chopped serranos, mushrooms and at the end, spinach. We both thought it was delicious and will definitely make it again! Maybe even add some corn. Substituted the stock with Better Than Bouillon and loved it. Nice! I like all your changes. They sound great! Made this in my new ip exactly as written but used chicken tenders that were frozen and needed to be used. And I used the original style diced tomatoes with green chiles. My hubby and I thought it was perfect. Just the right amount of heat. I love thick soups and chowders. Served with tortilla chips instead of crackers. A keeper for sure. Thank you for all your awesome recipes. So glad you and your hubby enjoyed it!